You can enjoy Cherry Blossom Viewing on KIYAMACHI - dori (street) in the downtown area. KIYAMACHI is a narrow alley runnning from Shijo-dori to Sanjo-dori next to *Pontocho Area. It's located near Shinkyogoku / Teramachi Kyogoku Shopping Arcade and *NIshiki Market, so you can drop in KIYAMACHI before or after shopping. 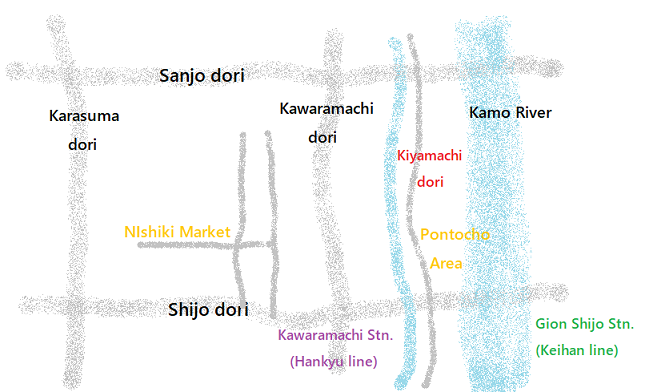 Nearest stations are Kawaramachi (Hankyu line) and Gion Shijo (Keihan line). *Nishiki Market : known as 'Kyoto's Kitchen' with full of shops and restaurants where you can find a wide varitey of Kyoto-ish things. 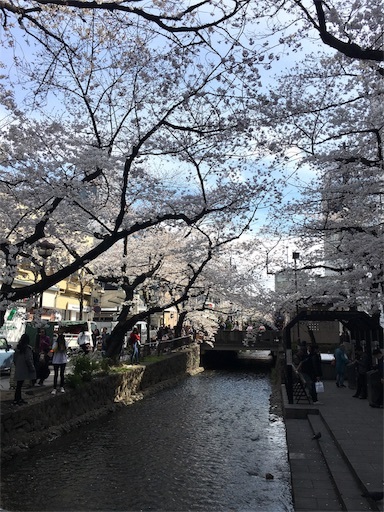 How can you enjoy *Hanami in KIYAMACHI ? 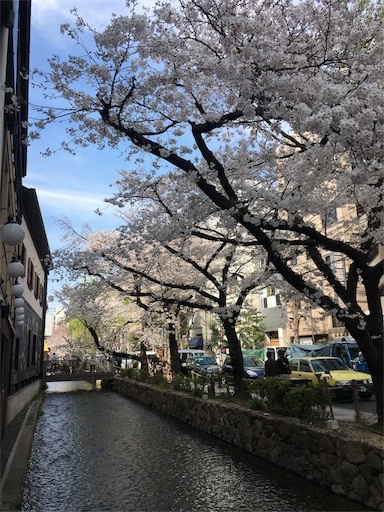 You can walk along a canal (Takase River) lined with cherry trees. It's a bit crowded near Shijo-dori, but if you keep walking up the alley, it'll become relatively quiet. There are small bridges across the canal, where you can take beautiful pictures. *Hanami- means 'cherry blossom viewing' in Japanese. 'Hana' means 'flower / blossom' and 'mi' means ' see / view'. There are some cafes along the alley. Some chairs and benches are placed outside of TRAVELING COFFEE . If you buy a drink at the cafe, you can use one of them. Enjoy your drink, giving your feet a rest and viewing cherry trees in bloom. Can you see a light in the picture above? 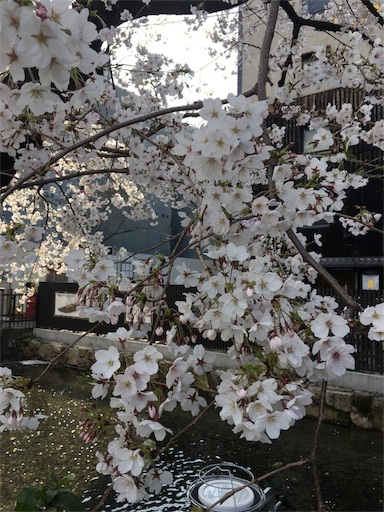 Cherry trees are illuminated at night, so it may be a good idea to come to KIYAMACHI to enjoy a romantic atmosphere after having dinner in Pontocho area.